ICONIC TALISMAN: Yes, though only glimpsed for a moment. POV RUNNING THROUGH WOODS: Yes. that overmarketing will kill a brand, but it’ll also make the producers rich… so who cares? and that while people no longer believe that “pictures don’t lie”, they are much more likely to suspend their disbelief if a movie camera is hand-held. These are all interesting lessons, but they’re not really enough. So while there’s a line to be traced directly from Blair Witch to Here Comes Honey Boo-Boo , the really interesting developments that should have followed Myrick and Sánchez’s work took almost a decade to appear. I guess it’s only fitting that one of the best of the current crop of movies that bear an obvious relationship to Blair Witch should come from none other than Eduardo Sánchez himself. Lovely Molly starts with a knowing reference to the most famous moment from the 1999 movie: the heroine sits in front of a camera, sobbing in despair, apologizing for the horrible things that have just happened. Yes, says Sánchez, I made The Blair Witch Project ; let’s just get this out of the way, shall we? The first second or two of this introductory scene feels like a quick wink from the director. But enjoy the moment: a split-second later, things get very unpleasant indeed. The movie doesn’t wink again. It maintains a steady, ice-cold stare and doesn’t look away for a moment. Molly and Tim have been married for about a year, and life for them is not easy. They’re both blue-collar folks — hats off to Sánchez for making a horror movie that remembers most ordinary people, even haunted ones, have jobs and responsibilities! Tim is a truck driver whose job requires him to be off on the road for long stretches. Molly is a janitor at a mall. They’re just about the least glamorous and most compellingly realistic couple ever to inhabit a horror flick. Money is tight for the couple, so they are relieved that Molly’s family’s old house is available for them to live in for the first few years. It’s actually a very nice old farmhouse, far bigger than anything they could hope to afford… but it’s an old house, and subject to all sorts of inconveniences. It’s also the place where Molly’s father met a messy end when she was just a child. Molly herself has had issues related to her father’s death: she’d become addicted to drugs as an adolescent, and had spent some time in an institution… apparently for more than just detox. There are definitely bad memories hanging about the place. But in Molly and Tim’s position, the troubled past must make way for the troubled present. Almost as soon as the movie’s been set up for us, the couple experience a terrifying midnight break-in at the old farmhouse. When the police arrive, they don’t find anybody on the premises, but Tim and Molly know they heard someone moving around in the pitch-dark house. It’s never made clear if the break-in has anything to do with the sinister events that play out through the rest of the film, but that doesn’t matter. The break-in puts us immediately in sympathy with Tim and Molly — reminds us of their vulnerability by putting them in a realistic situation with which we can identify very easily. Shortly thereafter, Tim has to leave on an unexpected job. It’s good he’s getting work, since the couple needs the money. Unfortunately, this means he’ll be out of town for Molly’s birthday. Molly’s hurt by this at first. Eventually she makes peace with Tim (over her cellphone), but she’s still pensive when her vivacious older sister Hannah comes to celebrate with her. Things start to go bad when Hannah unthinkingly shares a joint with her sister over slices of birthday cake. Hannah immediately regrets her action, remembering Molly’s substance abuse problems. Molly simply brushes off her sister’s concern. But that night — coincidentally or not — the disturbances begin for Molly as she tries to sleep, alone, in her father’s old house. It certainly feels as though there’s someone in the house with her… particularly in her father’s old study, with its peculiar wall-full of horse pictures. Is that really a voice that she hears whispering fiercely to her? Are those the sounds of footsteps coming from downstairs? Or is she just imagining things in a house full of bad memories and bad floorboards? After a few troubling incidents, Molly casually approaches her sister at work and asks her of she could, maybe, score her a little weed to help her relax. This sets off all sorts of alarm bells with Hannah — as well it ought. In the meantime, Molly continues to lose sleep as the strange events continue at the house. The light in the bedroom she shared with her sister growing up seems to turn itself on every night. Molly’s even awakened by the sound of a child sobbing from that room. The strange occurrences are accompanied by a high-pitched ringing sound, like the buzzing you get in your ears sometimes (for example, before you faint). And all the while, the narrative flow is interrupted by brief cuts to hand-held video camera footage taken by Molly herself. Why is she singing to herself in that eerie, girlish voice? Why does she seem drawn to her neighbor’s house, to look through her windows… to spy on her children? What is the meaning of the curious horse-headed talisman Molly takes from its hiding place in the cellar? All through my first viewing of Lovely Molly , I found myself deeply impressed. Here, I thought, was a Bad House movie where it was clear — unambiguously clear — that the haunting was entirely in the heroine’s troubled mind. Molly is deeply disturbed; by the time she climbs into the attic and digs out the secret stash of heroin she’d hidden before they took her away as a teen, we see that she’s never really recovered from her early traumas. With an addict’s cunning, she’s convinced herself as much as everyone else that she’s outgrown her issues; but it’s not true. Her stash suggests she’d never fully intended to break free of the drugs — not in the deepest part of her. And her use of the drugs suggests that she’s never been free for a moment from the demons of her childhood. Of course, the main demon of her childhood was her own father. The sobbing that she thinks she hears coming from the closet in her old childhood room? That’s the ghostly echo of her own sobbing, a long time ago, as she hid in the darkness while her father did unmentionable things to Hannah (and later, to her). And the Thing that eventually comes clomping up the stairs at night, chanting Molly’s name over the clatter of approaching hooves, is her father’s evil spirit. …but can we trust the video? Later on, when Molly’s employer shows her surveillance camera footage that seems to show her having a seizure, we discover that what Molly sees in the same footage is herself being raped by a dark stranger. When the boss blames Molly for what he sees on-screen, not realizing Molly sees it so differently, it drives the already-distraught girl into pure raving hysteria. Clearly we cannot trust what we think we’re seeing through Molly’s eyes… or even through Molly’s video camera. Gretchen Lodge, as Molly, does a fantastic job of portraying a woman gradually succumbing to mental illness. The central tragedy, the core of Molly’s deterioration, is that she has been corrupted by her father. She has a horrible affinity for his abusive nature — whether through some hereditary illness, or just as a result of the perversion of the natural bond between father and daughter, she is becoming like him… and the strain is destroying her. It’s a brave performance in what appears to be a brave film… a film that doesn’t shrink from showing us a truly damaged psyche… a film that keeps us sympathizing with Molly, even after her collapse has made her a monster; a film that doesn’t bother to suggest the haunting is real, but shows us instead how irrationality leads to stories of ghosts and demons. At least, that’s what I thought I was watching. But then… after I’d watched the brutal, uncompromising story of a woman destroyed by the demons of her own mind… I saw the movie’s brief coda. And then I watched the DVD Special Features. And then I went on-line to see what others, including Eduardo Sánchez himself, had said about the film. And boy, was I ever surprised. Because it turns out this superbly unambiguous study of Haunting as Mental Illness was actually supposed to be a genuine Demon Possesion film. Tell me, if you like, that Citizen Kane is a film about sledding. Tell me that Titanic was an educational film about boating safety. Tell me anything. But please! By Azazel, by Samael, by Jor-el and Kal-el… by Baphomet, by Calumet, by Comet and Cupid and Donner and Blitzen, don’t try to tell me that Lovely Molly ‘s about genuine demon possession. I mean, they’d done so well, up until the coda! It’s as though they watched Uruguay’s La Casa Muda and thought, “Yes, very interesting — but that’s not the way mental illness really works; we can do this better.” Sánchez & Co. gave us a sensitive portrayal of Molly as young woman with deep psychological problems… problems that just happened to manifest themselves as some kind of supernatural visitation. They showed us how trauma and substance abuse lead to Molly’s break with the real world, into a terrifyingly real-seeming hallucination that eventually destroys her life (and the lives of those around her). They showed us a harrowing illustration of the cycle of abuse. There was absolutely no need to drag the Devil into it. And in fact, dragging the Devil into it cheapens the whole story. I’ve already had enough of Pat Robertson and his ilk on my TV screen, blaming the latest natural disaster on gay marriage and unwed mothers — some evangelical yob insisted the hurricane that tore through my town and my state in 2012 was God’s warning, because the evil liberal northeast was too soft on the sodomites. With this foolishness still ringing in my ears, the very last thing I want is another movie suggesting that some serious, tragic problem — like mental illness — is actually demonic possession. Are you kidding? Demonic possession is almost cosy compared to the alternative. Now, if you want to think of Lovely Molly as such a conventional horror film, you can. There’s enough leeway in the telling of the story to support either conclusion, if you absolutely must have some ambiguity about the supernatural. Until the coda. The coda ruins everything by tacking on a hackneyed “it isn’t over” epilog — actually, now that I stop to think about it, it isn’t even the coda in its entirety so much as it is one gesture: one spoon-fed piece of information left out for us (and for one of the surviving characters) in an obvious place, to let us know the whole story’s been stage managed by Ol’ Scratch. Turn off the movie just before the epilog, and you’ll be left with a near-masterpiece. You’ll see a convincing portrayal of evil as an inside force: something that results from poor choices and poisoned opportunities, something that’s passed down across generations like a disease. Something that forces us to hallucinate demons and ghosts to externalize the horrible pressures within. Something tragically human. Watch it to the very end, though, and all you’ll see is another average horror movie. This is not to say that there aren’t other problems with Lovely Molly , too — principally its male characters. The preacher-man, Pastor Bobby, is way too easy a target — I say this aware that I might be accused of contradicting myself in my outlook on religion in this film. But seriously: Pastor Bobby is much too much the cliché of the venal priest. Furthermore, Tim — who is in every other way the picture of a loving and long-suffering husband — does something thoughtless and stupid in the course of the story. Not only is what he does out of character for the man we’ve seen so far, it’s also brought into the story so abruptly, with such inadequate preparation, that a common reaction in viewers is to look back and question whether it was really Tim in those scenes. Worse, it feels as though the only reason this lapse was written in was to give Molly some sort of twisted justification for what she does to him. I’d like to think we’ve reached a stage where we can allow strong female characters to stand on their own — even as monsters. There’s no reason to weaken the male characters just to build some sort of misguided sympathy for a strong woman. Examining some of the most interesting horror movies of recent years that owe an obvious debt to The Blair Witch Project , over a decade later… starting with this misunderstood gem from Spain. POV RUNNING THROUGH WOODS: Oh, yes. Like many people, I have a habit of saying and doing incredibly stupid things. I’ve even made some of my stupidity public — enormously, permanently public — by posting it here on-line. One of the very dumbest things I’ve ever said was in the introduction to a review several years ago, where (for some reason I cannot begin to fathom) I came right out and stated that very few movies had ever attempted to follow up on The Blair Witch Project . (I’ve kept the original review unchanged and unedited, because I don’t believe in trying to make myself look better in hindsight. However, if you think I’m going to link to it directly, you’re out of your mind. Go find it yourself!). That statement was demonstrably untrue at the time I made it, and is even more foolish-sounding now. What I think I’d been trying to say was this: since the startling, innovative aspect of Blair Witch was technical rather than narrative, very few exploitation-movie makers understood it well enough to make a genuine follow-on. Sure, every big cinematic success has been a combination of technical achievement and narrative appeal; but it’s generally the narrative and not the technique that gets ripped off. Intelligent film-makers looked at Jaws and studied Spielberg’s technique: for instance, his method of building tension, and then releasing it in ways that made the audience think they’d just seen something far worse than it was. Mere imitators looked at Jaws and thought about re-doing the story with a bear, or an octopus. But with Blair Witch , at least for the first few years after its release, it seemed as though the best the exploitation film-makers could come up with was (to continue the comparison) Jaws with a slightly different shark. They didn’t really contribute anything meaningful to what had already been done: they could only duplicate, by sending a group of kids into a dangerous situation with camcorders. At least, that was my thesis… it wasn’t the brightest idea I’ve ever come up with, and my lame attempts to defend it haven’t made it seem any more intelligent. I stand by this point, though: the real lessons of Blair Witch had little to do with the overt setup of the film. One lesson — a superficial one — was that given enough footage and some skilled editors, you could tell practically any story you wanted, and tell it magnificently. It was a lesson that the makers of reality television learned well before actual film-makers did. One of the most interesting points of the 2007-8 Writers’ Strike in the U.S. was the demand of the editors of reality shows to be allowed to join the Writers’ Guild. By cutting up and re-arranging hours upon hours of raw footage, they were creating — out of “reality” — new characters and story arcs that didn’t exist until the edits were made. A deeper lesson to be gained from Blair Witch is that modern viewers should be very, very careful believing anything they see… no matter how convincing it may seem; no matter how professional-looking the associated web site may be. It’s taken a while, but in recent years horror film-makers have really started to internalize this lesson and build on it. The result has been some amazingly thoughtful films that use the entire phenomenon of The Blair Witch Project , and the familiarity of Reality TV, to question the presentation of “reality” on-screen. Atrocious is one of these films. Dismissed by many as a late-to-the-party Spanish Blair Witch rip-off, it is in fact a subversion of the earlier film. And the twist at its end is, in a way, brutally funny. Atrocious immediately acknowledges how much the camera has invaded our lives in the years since Blair Witch was made. Remember how many people complained that the characters in the 1999 film kept their cameras rolling long after it seemed prudent to stop? Well, welcome to the new millennium, where there’s nothing in our lives too trivial that we won’t try to capture it and share it on YouTube or Facebook (oh — and nothing too momentous that we won’t try to reduce it to 140 characters for Twitter. We are slaves to our cellphones — but we don’t much care about reliable telephone service any longer, as long as our phones take good pictures and video, and allow us to access our social media… but I digress). In the case of Atrocious , our young protagonists — Crisitan and July, brother and sister — have a video blog, on which they research and document spooky urban legends. In spite of the fact that they are still very (very) young, they’re seriously committed to the blog, and have invested a good deal of time and energy into it. That’s why they’re a little miffed that their mother and father are taking them (and their little brother, who’s still too young to go ghost hunting with them) off to the country for the summer. Fortunately, the kids have a back-up plan. Their vacation home is near the site of a spooky rural legend: when someone gets lost in the woods of Garraf, the spirit known as Melinda — a ghostly little girl in a red dress — will appear and guide them to safety. As long as the kids are stuck in the boondocks, they might as well investigate that. Their little brother José can always just stay behind and play with the family dog. The first clue we have that Atrocious is not going to be as straightforward as it seems comes from its epigram: “The mind is like a labyrinth, where anyone can become lost.” Hmmm. Our second hint comes from the location of the family’s vacation home… its creepy old vacation home. It’s in Sitges, which (as if you didn’t know) is home to a very famous Fantastic Film Festival — sort-of the Cannes of horror films. Hmmm. The third clue comes when the kids are exploring the house. In the basement they find a stack of VHS tapes. One of the tapes in that collection turns out to be very important at the tail-end of the film; but what the kids themselves find is a copy of Dario Argento’s The Bird with the Crystal Plumage , which they pop into the deck and watch for a few minutes. Finding an Argento film in conjunction with… that other tape that plays at the movie’s end… is just plain silly — and I think that was the point. It’s a joke that Atrocious ‘s intended audience will pick up on quickly. Then, too, we need to consider the movie’s opening statement. The Bird with the Crystal Plumage is notorious for the inadequacy of its “psychology”: as Maitland MacDonough points out in “Broken Mirrors, Broken Minds”, when the TV shrink is trying to explain the killer’s motivation at the end of Argento’s film, his interviewer falls asleep… thus revealing Argento’s contempt for the reasonable explanation. Clinical accuracy was not the point in Bird… , and that’s something the makers of Atrocious want us to remember. Thinking of memories: it turns out the children haven’t been to the house in Sitges in so long that their recollections of it are very dim. Certainly they never heard the legend of Melinda while they were there. Their father’s friend Carlos fills them in on the story as he’d heard it: they say that Melinda had disappeared in the woods, or possible had fallen down a well… her body was never found, but she still roams the woods at night, looking for her mother. Those who have encountered her ghost in the forest say they never forget the terrifying sound of her whispers as they creep up behind you. Is Melinda an evil spirit? Carlos doesn’t think so, but the stories are too numerous and varied to be sure. Nevertheless, Carlos promised his own father many years ago that he would never go into the woods of Garraf at night. And he never has, even as an adult. Carlos’s seriousness makes a big impression on the kids. Later, Cristian wakes up in the middle of the night, convinced that he hears strange noises coming from the woods around the house. Could this just be just the influence of Carlos’s story on an impressionable young boy? Or is something stirring? Cristian and July begin their investigation the next day, on the first of April ( HMMM! ). Normally they’d have to sneak around to do their research; but today, conveniently enough, their Dad has been called back to work in Madrid. That’s great news for the kids — their Dad doesn’t approve of the video blog (“Do you think that’s normal?” he asks, in the tradition of Dads everywhere), and has threatened to punish them if they continue with it. Now that the old man is out of the way, Cristian and July feel safe exploring the house and grounds with their camera. Their first stop is the basement, where they find an assortment of peculiar junk: their old toys, an anatomical model of a human foot, dolls left over from their mother’s childhood in the same house… and a trunk full of mirrors. Odd. There’s some sort of journal, too; but that’s obviously boring, and they put it aside unread when they discover the box of videotapes. Cool! Bruce Lee! And Dario Argento! All three kids are immersed in a horror film when they’re distracted by a sound from upstairs. Someone’s dropped a glass in the kitchen above… When the kids rush upstairs, they discover that someone’s also been rummaging through the cabinets. But who could it be? Dad’s gone, and Mom’s upstairs asleep. Perhaps the paranormal has come to find them already? …but though he doesn’t lose his glasses, or (worse yet) fall in, Cristian may not have got off quite as easily as he thinks. There may be other consequences of what he’s done. For as the kids pick their way out of the maze, Cristian thinks he sees someone else in the maze with them. Just visible through the hedges is a light-colored shape that could be a pillar… or could be a statue… but could also be another human being. Cristian wonders if it might possibly be their Mother, but July is certain it isn’t. Looking at the videotape later with José, they’re unable to decide if it’s really a person or not. It could be someone huddled in the hedgerow, or it could be nothing at all. That night, Cristian attaches the camcorder to his laptop and points it out the window at the gate to the labyrinth. If there’s really something in the maze — maybe the same thing that made the mysterious noises the night before? — the camcorder will capture it. And something does happen during the night… though it’s not the camcorder that gets a good look at it. If there’s one thing in life that really brings me joy — one thing that makes everything else worthwhile — it’s dog noses. I love dog noses, preferably the big, wuffly-snuffly kind that come up and shovel you for attention. I like them mostly because they’re attached to an actual dog, but I also appreciate them for the precision instruments they are. The sense of smell is the most important way dogs get information about the world around them. Their noses are so sensitive, I’m told, that some dogs can get scent cues from as much as a hundred miles away. And did you know that some dogs can sense when their humans are about to have an epileptic seizure? It’s true: the neurological condition brings about changes in human body chemistry, which the ultra-sensitive doggy snoot can detect. Thus the animals can be trained to alert their companions before a seizure happens, so they can prepare themselves and keep themselves from harm. You’ll have guessed I’m stalling. You see, it’s the dog who senses activity in the maze overnight. He’s not frightened of it: he’s fascinated. It’s almost as though something hidden in the maze were talking to him, urging him to come in. And eventually he does… and he never comes out again. In the morning, July and Cristian go looking for the dog. Little José is particularly upset over the dog’s disappearance — and who wouldn’t be? July suggests searching the maze, but the kids’ long-suffering mother doesn’t want them going in there. It’s overgrown and dangerous: it was easy enough to get lost in the maze when it was still in good repair, but now? Who knows what’s in it — even if it’s not a ghost? The dog has been mutilated. Clearly it wasn’t a wild animal that killed him and dragged him off into the well. And as if the dog’s death wasn’t bad enough, they have something worse to look forward to when they get home: keeping a brave face for José, and not letting him guess what they’ve found. My readers know how I feel about the inclusion of animals in movies like this. They’re usually thrown in just to be brutalized… just to be the first to die, to shock the viewers before bad things start happening to the “actual characters”. Fortunately, these days we’re less likely to see horror movies in which the animals are really killed. But I don’t object to animals-as-characters suffering the same kinds of fates as the humans, provided they are taken seriously. And here the dog’s death is taken seriously. It’s not just a meaningless shock-moment: it’s a loss that’s felt very deeply by July and Cristian, all the more because they need to keep it from the heartbroken José. The killing of the dog is a moment that draws us into a deeper involvement in the story, rather than simply giving us a cheap thrill. In a sense, when you consider the end of the film, this involvement turns out to be a trick… but I still think in this case, the dog is not sacrificed in vain. Unlike domestic animals, children are not usually put in any real jeopardy in horror films… particularly Hollywood horror films. In a sense, that’s a good thing: violence against children in movies is a very strong gesture, and it needs to be approached with care. That said, though, it’s become something of a cliché for children to come out unscathed from scary movies. So it’s a little refreshing to see that Atrocious is courageous enough, first, to earn the earn the right to put its young characters in real danger, and then to actually follow through with the threat. We’re told from the very beginning that terrible things are going to happen to the whole family. And terrible things do happen: rarely in horror history have kids been so thoroughly butchered as they are here. For it turns out that this was not a good time for Cristian and July to be curious about dead children in Sitges. Something has been awakened by their curiosity… something that has been asleep for a long time; something that knows the woods and the maze intimately, and wants to draw the children into it. Something that will cause one of them to run a long way through the trees with the camera set to night-vision, à la Blair Witch … while seeing nothing. Something that will also leave one of the kids alone, terrified and burbling into the camera in a very familiar way. In fact, the connections to (and quotations from) The Blair Witch Project are so obvious that it’s easy to see why some viewers have written the movie off as a pale imitation. But then, there’s the ending. Just at the crucial moment, when it seems like everything’s about to be revealed, the movie comes to sudden halt. We’re then given some news footage of the aftermath of the “atrocious” events we’ve been seeing. It turns out to be even worse, and even bloodier, than we’d expected… but that’s not the only surprise in store for us. No sooner have we been given a glimpse of the aftermath, when we suddenly find ourselves rewinding — actually, literally rewinding the tape: we’re back at the story’s real conclusion, the revelation of what horrible force-from-beyond has risen from the labyrinth to slaughter the family. And it’s then that we realize we have not been watching the movie we thought we were watching. The film-makers have learned the lessons of The Blair Witch Project very well. They’ve figured out how to use the POV camera to build atmosphere — how to stretch out a sequence just long enough without becoming intolerable, and how to suggest just enough without showing us anything. And they’ve also factored in our awareness of the existence of The Blair Witch Project , as well as its progeny. As a result, they’re able to pull of a nice piece of misdirection. Some reviewers complain the twist isn’t fair. Really, it is: if you go back and watch the movie again after you know its secret, you’ll see how you’ve been tricked… but the movie’s played fair with you all the way along. Others complain that the resolution of the story isn’t the way things work in real life… to which both I and the movie offer no argument. I think that’s why the movie goes out of its way to bring up The Bird with the Crystal Plumage . On a certain level, Atrocious is a horror film about horror films: it sets up the conventions we expect and then pulls them all away just when we’ve come to rely on them. What’s more, by showing us glimpses of the end at the beginning and putting the epilog before the dénoument, it teases us mercilessly. This is something the Spanish seem particularly good at: not just giving us a twist ending, but thinking deeply and dispassionately about the mechanics of film, and coming up with something that forces us in the audience to consider our responses to it. 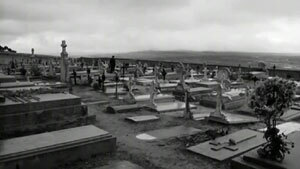 This was what Jaume Balagueró did with Darkness : he dared to set up a very conventional horror film for the first half of his movie, taking the risk that his audience would lose interest… but when he got to explaining the motivations of his monsters, he managed to subvert the very conventions he seemed to be repeating. Atrocious , too, takes one hell of a risk, by seeming to be slightly above-average Blair Witch rip-off for most of its running time.